Design, DIY, & Inspiration. After all, home is where the heart is. Occasionally we see a trend in fashion and want to incorporate it into anything we can. This serious will take the latest fashion trends and show you how to turn in into home decor! 05 Mar	This entry was published on March 5, 2013 at 7:20 pm. 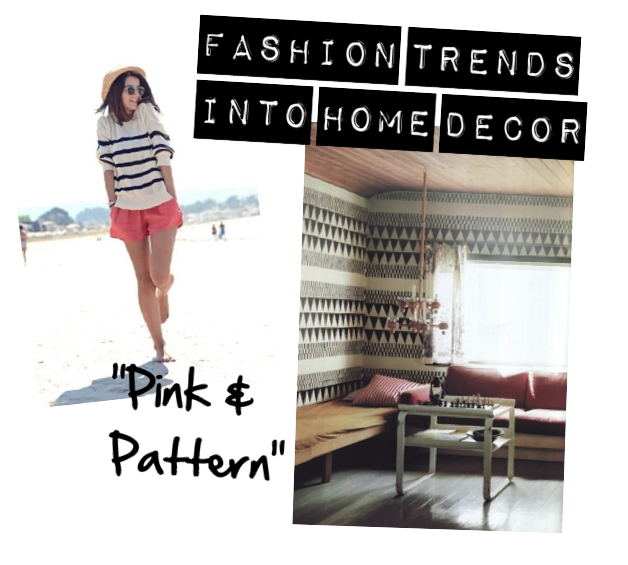 It’s filed under Fashion Trends Into Home Decor and tagged Bench, chevron, coffee table, fashion, Fashion Trends, Home Decor, Living Room, pattern, Pink, strip, Trends, Wallpaper, wood. Bookmark the permalink. Follow any comments here with the RSS feed for this post.